I'm pleased to announce my latest release of "Caddis 1" as a Limited Edition Fine Art Print. P.S. All Limited Edition Prints are signed, numbered and come with a certificate of authenticity.
" Referrals make the World go Around!" Truer words were never spoken in today's business, and over the years I have benefited greatly from design professionals and individuals referring me to leads for possible projects. I thought I'd share a few memorable referrals, so I've inserted a couple of photos of referred projects and the designers involved. 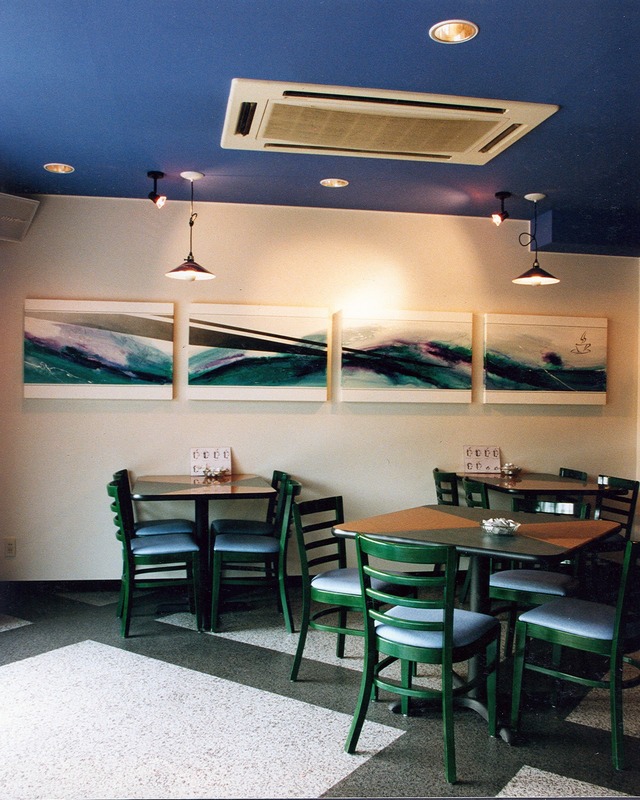 Here's "Espresso Americano", a coffee shop in Kyoto, Japan. 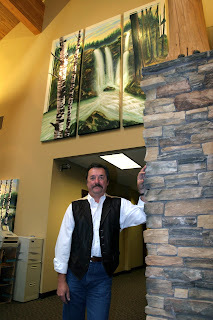 I had the pleasure of working with Jeff Nagel www.jnageldesign.com in Edmonds, WA. Thanks Jeff! 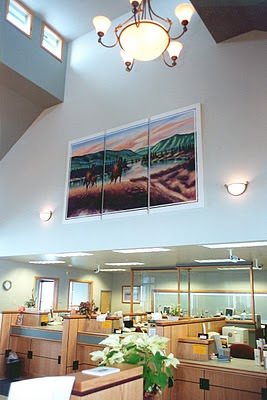 Here's the First State Bank of Thompson Falls in Plains, MT. That's just a few examples of what can happen when folks see opportunities, and generously share their vision with clients and the artist. I'd like to encourage you to keep me in mind for your referrals! Here's my latest original acrylic on canvas, the 36" x 36" is pictured here prior to framing. 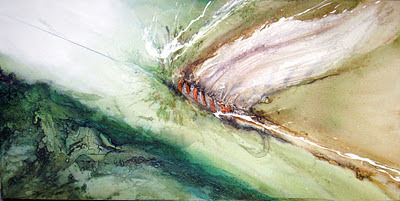 The piece features a favorite fly, the " Royal Coachman ". This painting has been juried into the Spokane Valley Arts Commission Art Auction for 2011, coming up in Sept. The originals of "Royal Wolf 1" and "Wooley Bugger 1", both framed, will also be on the auction block at this event. I'll have more on that as we get closer to the event date. 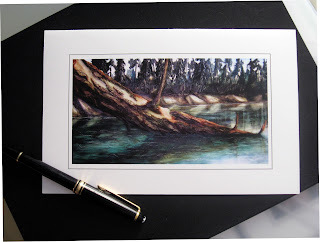 The piece is now available in fine art note cards and will be released as a print in the near future. It's always a good idea to take a look back once in a while to see where you've been. It helps us understand how we got to where we are now and gives me a better understanding of how I have evolved as an artist. In the weeks ahead, I'll be featuring some of my signature projects over the past 34 years, the clients, designers and locations of many of these commissioned art works. First off, the Spotlight is on Holman Aviation of Great Falls, Montana. In 2005 I was given the opportunity to create a collection of three original canvases for their interiors. 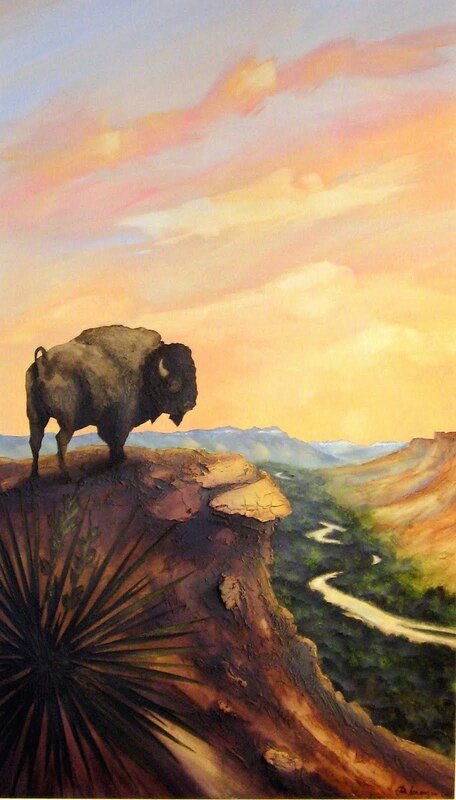 These works feature major landmarks in the Great Falls area, including the Great Falls of the Missouri, Giant Springs and a study of a Bison overlooking the Sun River Valley. 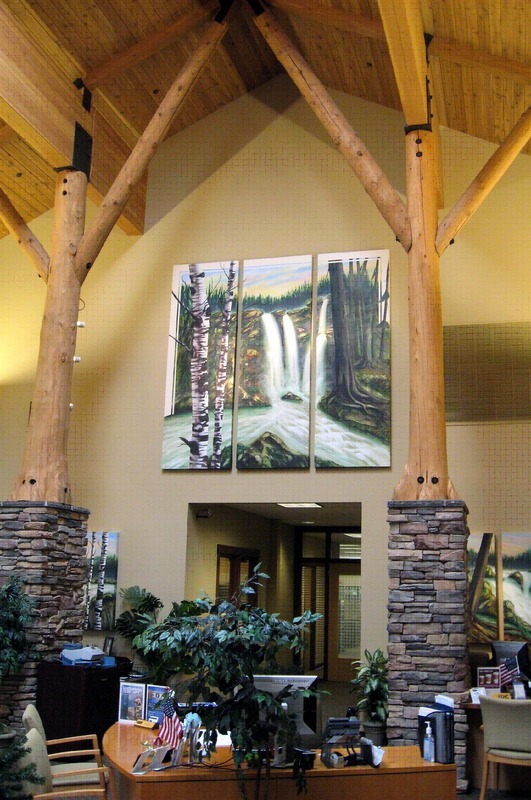 If your flying into Great Falls, or in the area, it's worth the time to check out their beautiful facility and this art on canvas. 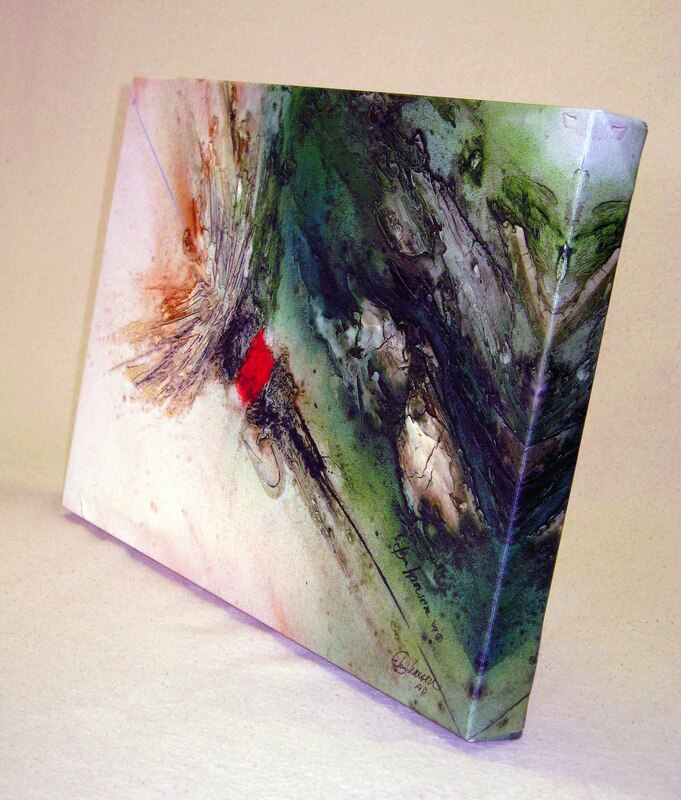 While your there, say hi to Cecelia at the front desk, she'll be happy to show you all the latest Gift Boxes of my Fine Art Note Cards that they have available. I'm happy to say that Holman Aviation is my primary retail outlet for my Note Card Collections in Great Falls. Spokane Commission now on the easel! I'm well underway with a commissioned painting for the offices of Spokane's Moloney + O'Neill, Corkery & Jones Benefits Inc. I'm pleased to say I've been given the opportunity to create an original painting featuring the subject matter of one of my favorite iconic scenes in Spokane, River Front Park, featuring the Radio Flyer slide, aka "Big Red Wagon", the Clock Tower, river bank and park. This piece will liven up an otherwise large blank wall in on the 7th Floor of their offices at 818 West Riverside. As you can see from this photo, this wall needs something! I'm excited to have been chosen to have my artwork in Moloney + O'Neill's interiors. We're looking forward to the unveiling of the piece in June. I'll share an update with the completion of this project. Moloney + O'Neill has a long history of supporting the arts in Spokane, I'm thrilled to have my business join a long list of those who have benefited by that support. A big thanks to the forward thinking of Mark Newbold and Moloney + O'Neill for this opportunity. Hard at it, working on the Clock Towers details. 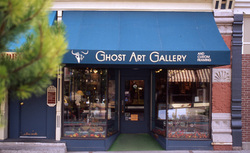 I'm Happy to announce the Ghost Art Gallery in Helena, Montana is now representing my Limited Edition Prints! I'm excited to say that you can now find my Limited Edition Prints and Note Cards at the Ghost Art Gallery on historic Last Chance Gulch in Helena, Montana. 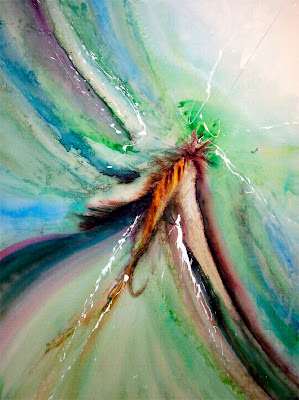 The Dana Gallery in Missoula is now featuring my Paintings! I'm excited to announce that the Dana Gallery in Missoula, Montana is my exclusive dealer for my original canvases in that region. If your in the Missoula now or in the near future, you must stop in to see their beautiful gallery at 243 North Higgins Ave. If your on line in distant lands, you can click on their link below and explore the artwork that they have available. Just a quick note, I've been receiving allot of positive feed back with what a nice email presentation the Blogspot "Follow by Email" is. If your interested in keeping up with all my new posts of my new Artwork, please find the "Follow By Email" box on the left side of this page, click on it and fill it out. It appears to be fairly private, as I can't see who's come to it and they say they keep it confidencial. Also, you can link right to my website as well! Celebrating Fishing Season Opening Day! 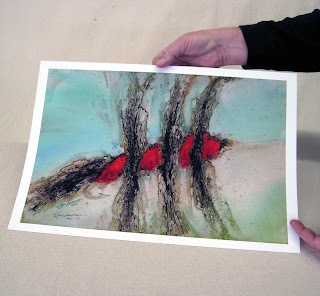 Pictured here I'm illustrating the Wooley Bugger Fly print by holding it, it's size is 11"x16" done on archival media paper, delivered to you in a mailing tube, I've priced this at just $85.00. Each of these limited edition prints are an edition of 1/499, a certificate of authenticity is included. 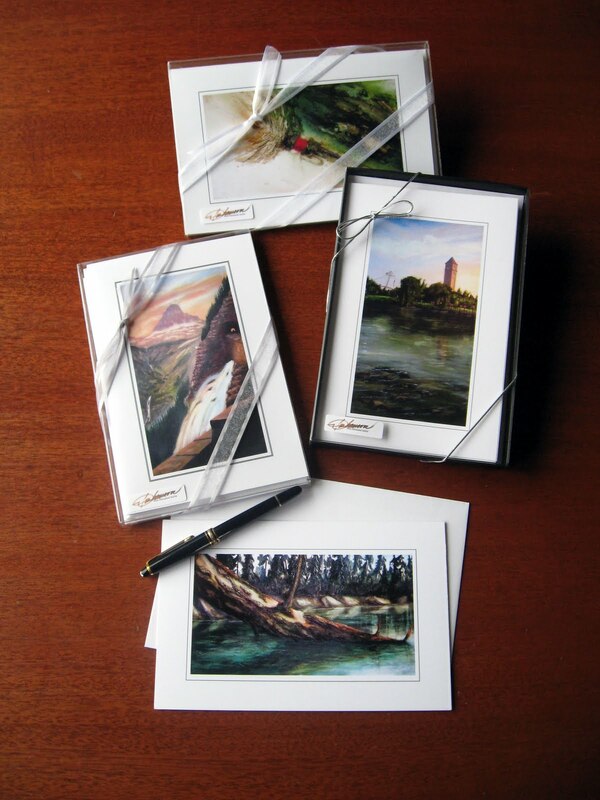 The Fine Art Note Cards Special is 1 additional free box of 5 note cards when you purchase 3 boxes of the 5 card package. You can choose from any of the cards available. The 12 card package does not apply. Now to order, go to my website store at www.tomhansonarts.com Then, go to the Print Store and the Note Card Store and place your order. With the Note Cards Special package, it will direct you to the "Contact" page where you can personally request your choice of one of the four boxes of five cards available. Thanks for following my blog and good luck fishing this spring. Watch for more specials in the future. Fishing season is upon us! 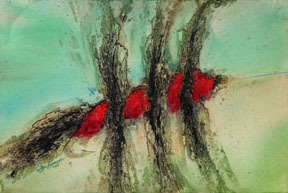 I was visiting with a client of mine a couple of years ago, I was showing him my new collection of Fine Art Note Cards that feature the imagery of my paintings, he shared with me his enthusiasm, and commented that one of the most precious things he looks forward to during the holidays was receiving a hand written note from his kids. That touched me and I realised that I felt the same way about receiving hand written letters and cards. Our conversation continued along the lines of "how we as a society have gotten away from the hand written word in our modes of communication." With e-mails, texts, twitters and the like, "we've become so impersonal." and motivation to continue to build my line of note cards. The cards are available individually and in Gift Boxes of 5 cards and envelopes as well as a larger box of 12. The collection has over 30 images to date with more being worked up all the time. They feature paintings of North Central Montana, my home, Spokane and the Inland Northwest, where I live today, and my collection of Abstract Flys'. This year I plan on adding more images which will include paintings of National Parks and The Pacific Northwest. On the commercial end, I've found the gift boxes an outstanding advertising medium for clients, we add the companies Logo to the gift boxes and to the back of the cards, making it a great ad art product. So in a nut shell, we're creating a tool for expanding a clients marketing and providing them with a wonderful medium of personalized thank you notes to their valued customers. I've attached a slide show so you can see a catalogue of the current card selection. If you'd like more information or place an order, you can connect with me through my website. Let's talk a minute about commissioned works, From the beginning of my business, that's been my niche. I started calling on corporate clients in L.A. in the late 70's. There was then and is now a need for art work on the walls of offices and facilities of all kinds, I saw the potential then and went for it. Since then I've created art works of all kinds, from Wall graphics that cover what seemed like acres of wall space, to collages utilizing Boeing airplane parts for their walls. Medical facilities, IBM buildings, insurance offices to apartment walls, from a cafe in Kyoto, Japan to a National Defence contractor in Washington D.C., my motto has been " no wall too big, none too small ". I still approach things in that mindset. The photo here shows a large piece done for the Panhandle State Bank in Coeur d' Alene, Idaho that I created for them a few years back, it illustrates nicely how my work has developed and how I take the environment in to account when custom designing a piece for a client. When designing a project like this I invite the client into the process, by that I mean that I look at this as a commercial art project where I'm creating this art work for them, so I ask them, "What would you like to see in this space", and why not, it's their space, they've got to look at it everyday, they should get excited about it, and by inviting them into the process we achieve that end! They're happy with it, and so am I. So, lets say you have a blank wall that has been crying out for something for some time, and you just haven't had the direction to go to look for an answer. A couple of things come to mind as to what obstacles you've faced, one is, It's just tough to pick something off the rack to fit the size of your space, big pieces are real expensive or the things you've looked at just haven't caught the nature of your area, business or the personalities of you and what you do. Well, that's were I can come in, as I mentioned, I design my work to accommodate you, where you live , what you do, what your interior feels like and do it with your budget in mind. I'll present you with a full color scale sketch in proposal form so you know that the art works will look like, and how much it will cost from design through production and installation. 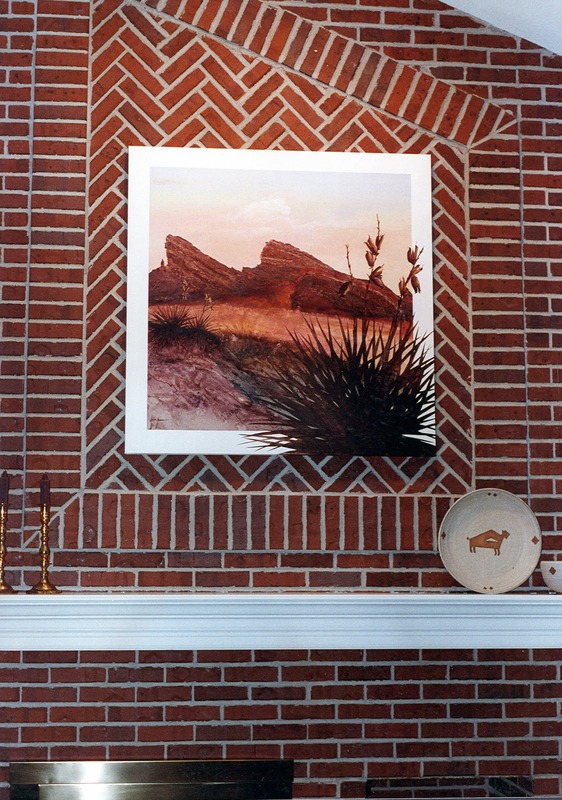 Here's short video slide show that illustrates a before and after look at a few walls. This week I'm off and running with my new marketing push for 2011, I'm celebrating with the release of my two new prints, these pieces are taken from my Originals, " Wooley Bugger1 and Royal Wolf1" these pieces are part of my current "Abstract Fly Collection." 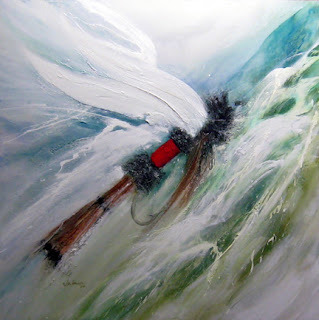 This body of work brings together my love for fishing, the outdoors and by love of abstract painting. 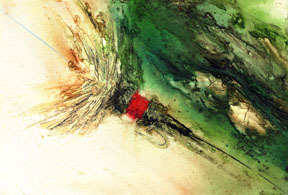 The originals feature a huge impasto technique, intense color, and the subjects include imagery representing actual Flys that fishermen use in many parts of the world. These Giclee prints have outstanding resolution and clarity, and bring a remarkable likeness to the reproduction. They are available in two different sizes on archival papers as well as canvas, and are available in Fine Art Note Cards as well. If your interested in learning more about sizes available and prices, just touch base back. More on all this later.